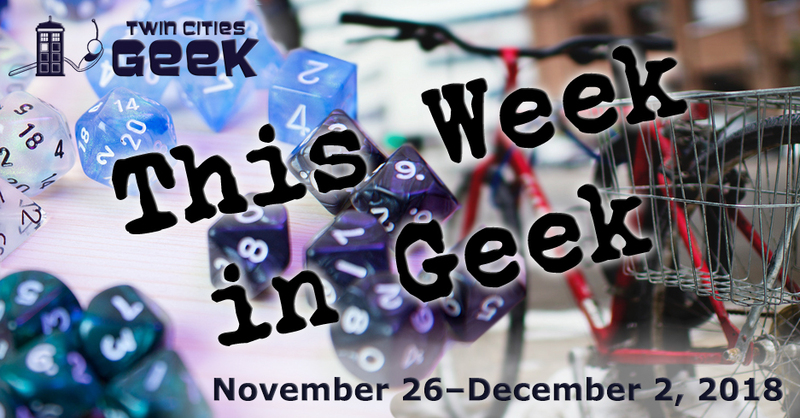 Welcome to This Week in Geek, your guide to events of interest to the Minnesota geek community for the week of Monday, November 26th to Sunday, December 2nd. When: Monday, November 26th at 6:30 p.m. When: Tuesday, November 27th at 5:00 p.m. When: Tuesday and Wednesday, November 27th and 28th at 7:00 p.m.
Two nights of Twin Cities-indie films. These humorous and critically acclaimed works include stories about private detectives, metal-heads, non-Scandinavian families, and more. Check out the event listings for movie schedules, and be sure to look at night two as well. Tickets are $10. When: Tuesday, November 27th at 7:30 p.m.
Come and experience YogaQuest, a blend of yoga and fanfiction storytelling led by certified yoga instructors. Experience a yoga workout experience and a story at the same time. The theme for this week is Spirited Away, the classic Studio Ghibli animated-fantasy film, so build up the flexibility you’d need to go on an otherworldly journey. This event costs $15. When: Wednesday, November 28th at 7:00 p.m. This regular event at Modist, hosted by Sam Spadino and Bacon, represents the convergence of two geeky favorites: a brewery that geeks out for innovative beer and absurd trivia. Trivia Against Humanity has also expanded and now has weekly events at Mortimer’s and Glam Doll on Tuesdays and other times. See the Trivia Against Humanity Facebook page for additional events. Join your fellow Whovians and trivia fanatics at the Driftwood Char Bar on Wednesday night for Minnesota’s only regular Doctor Who-themed trivia night, brought to you by the creators of TC Trek Trivia. This is an all-ages event with no cover, so expect seats to go quickly. This month’s theme is “Dear Doctor,” so get ready to answer questions about The Doctor, and brush up on the other topics listed on the event page. When: Friday, November 30th at 3:00 p.m. until Sunday, December 2nd at 8:00 p.m.
Jurassic Quest is a traveling event featuring life-sized and highly detailed replica dinosaurs capable of roaring and moving, running the gamut from adorable baby dinos to gigantic creatures (which can be ridden). There’s a wide variety of fun to be had here, including the life-size dinosaurs, crafts, movies, science, and more. There are basic tickets available to enter the event, and other possible add-ons, including green-screen photography and face painting. General admission is $20, with a number of other options available. When: Friday, November 30th at 4:00 p.m.; Saturday December 1st at 11:00 a.m.; and Sunday, December 2nd at 12:00 p.m. Enjoy the warmth of your community at this open-air, European-style Christmas market in Saint Paul, with handmade local gifts and decor, European-inspired food and delicacies, and of course, Glühwein (spiced mulled wine). These markets are popular in Germany and Austria during the advent season, and bring warmth and cheer in spite of looming winter. When: Friday, November 30th at 6:00 p.m. When: Friday, November 30th at 6:30 p.m.
Get in the holiday spirit with this Christmas-horror-anthology film featuring stories of demons, boring office parties, and stalkers. Tickets are $7.58, and the start time is fairly strict due to the Alamo’s late policy. Check out the Alamo Drafthouse for other movie events this week, including screenings of UHF and Conan: The Barbarian. When: Friday, November 30th at 9:30 p.m. Collaboration is the name of the game with Ghoulfriends, a new coven from Gothess. This is a night of music and art, with DJs, art vendors, and visuals by VJ Wednesday of Gothess. This is a great opportunity to come together with your fellow darklings for a night of creativity and togetherness. All queer/trans/POC and allies are explicitly welcome, and this event is 21+ with a $5 cover. Twin Cities Largest Tea Tasting! When: Saturday and Sunday, December 1st and 2nd at 9:00 a.m.
No reservations are necessary for this event featuring a wide variety of tea for tasting, a qualified tea blender to fulfill special requests, tea-related pottery, cheesecakes, and more. This is a great opportunity to shop, meet your fellow tea enthusiasts, and help a great cause, as admission is free but there is a suggested donation of $3, or a non-perishable food item. When: Saturday, December 1st at 10:00 a.m.; Sunday, December 2nd at 11:00 a.m.
Julmarknad is the American Swedish Institute’s Christmas market and holiday weekend festival, with handcrafted goods from local and regional artists, musical performances, traditional food, and Santa. Tickets are $12 for adults, $8 for seniors, $6 for children, and free for ASL members and children under five. So, enjoy some Swedish meatballs and warm glögg while taking in art; see the event site for details and artist listings. When: Saturday and Sunday, December 1st and 2nd at 10:00 a.m. Hang out at the Hallie Q Brown Center for a weekend of geeky fun by playing games, shopping, snacking, and meeting artists and authors. Meet and mingle with your fellow geeks, and just have fun! Costumes welcome. When: Saturday, December 1st at 1:00 p.m.
Geek out to the local with this event full of local authors, arts, and beer! This is a great chance to catch up with some of your favorite authors over a pint, or to track down that new great thing that will inspire you, whether it’s a book or a piece of art. Food and drink will be available thanks to Big River Pizza and Black Dog Cafe. When: Sunday, December 2nd at 10:15 a.m. and 11:15 a.m. When: Sunday, December 2nd at 12:00 p.m. When: Sunday, December 2nd at 12:30 p.m. Gender Jam—a meetup group for trans, gender-nonconforming, questioning, and intersex youth—will be meeting up for an afternoon of community and fun. This week, Gender Jam will be all about experiencing new worlds with a trans-friendly session of Dungeons & Dragons run by one of the event coordinators! As always, bring your permission slip if you are under 18. When: Sunday, December 2nd at 5:00 p.m.